Skype for Windows 8 was released! This Windows 8 version is available in almost all platforms such as Mac OS X, iOS, Android, and Windows and it is available for downloading now. Skype will also integrate with and replace Windows Live Messenger online chat service in future. The latest version of Skype is immersive, effortless, and fun to use. Skype will run in the background and users can set up Start Screen so that the Skype Live Tile shows notifications. With Skype for Windows 8, users able to swipe from left to right to see different categories, such as recent activity, favorites and a complete contacts list. In addition, it in-call experience also has been modified to take advantage of certain features in Windows 8. 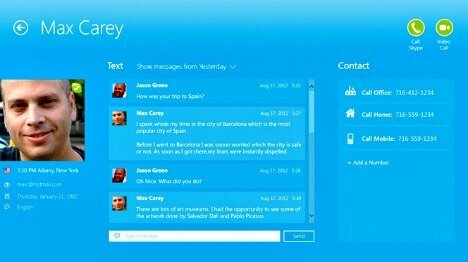 Skype for Windows 8 also integrates new People Hub features which users contacts are organized and merged with social networks, email, phone numbers, and other contact methods. Other than that, all the features that users know and familiar still remain. Skype is now offering 1 month free subscription for users, so that users can call offline contacts on their mobiles and land-lines. For users who looking for free offer of Skype, there is a great opportunity offered direct from Skype. Once finish download and installed, sign-in to Skype account. Click on “Claim your free month” button and select the payment method. 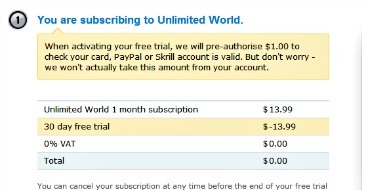 After activating the free offer, Skype will pre-authorize $1.00 to check users Paypal or skrill account is valid. Note: Users won’t be charged from the account. The free offer only available for Skype users that registered more than 29 days but not available in China, Korea, Russia, and Taiwan.